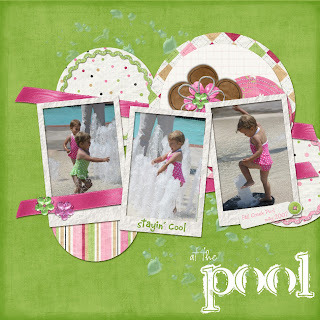 This LO was inspired by the weekly scraplift challenge at The Digi-chick. Somehow have a deadline makes me more creative. Challenges are aptly named it seems, in addition to getting me to create another LO, they also challenge me to learn new things - this week I was able to use the Distort-> Polar Coordinates to turn straight ric-rac into circular ric-rac, the trick is to make sure your object is 200% taller as somehow it shrinks when it turns into a circle. I haven't been able to really make it work with text yet. I'm also really pleased with the gel action that makes it look like there is water sploshes on the paper - at least I hope it looks that way to everyone else. 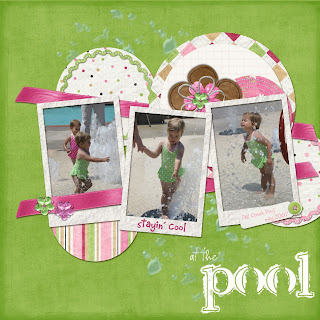 Cute, cute layouts! Love the way you did the title and the water spots. The colors you used are fabulous too! Great layouts!